Lifetone Technology of Oklahoma City, Okla., is recalling about 10,000 bedside fire alarms and clocks. The device can fail to operate and fully alert consumers to a fire. The firm has received 77 reports of alarms with a blank screen. No injuries have been reported. This recall involves Lifetone HLAC151 Bedside Fire Alarm and Clock with serial numbers ranging from AC160600001 through AC160604102 and AC170100001 through AC170106030 only. The serial number is printed on the left side of the silver sticker on the bottom of the unit. The bedside alarm and clock is an assistive alerting device intended for in-home use by individuals with hearing loss. The alarm detects the T3 emergency signal given by existing smoke alarms. When the T3 signal from a smoke alarm is detected, the alarm signals at a lower frequency, which may be better heard by individuals with mild to severe hearing loss. The alarm also gives spoken emergency signals “FIRE GET OUT” in both English and Spanish. Defective units continue to sound a low frequency emergency audio signal and spoken signal “FIRE GET OUT” in English and Spanish but the optional bed shaker, if attached, will not operate. The white, rectangle clock measures 8.5 inches wide by 4.2 inches high by 4.5 inches wide. 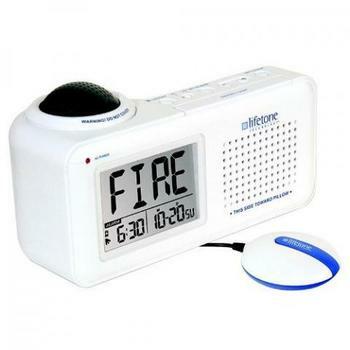 The fire alarm and clock has “Lifetone” printed on the front of the unit and a digital display with the date, time and type of emergency. There is a large black dome-shaped microphone on the top left of the alarm. The bedside fire alarms and clocks, manufactured in China, were sold online at www.lifetonesafety.com for about $215 and installed by fire departments and the American Red Cross nationwide from November 2016, through September 2018. Consumers may contact Lifetone Technology at (800) 648-7923 from 9 a.m. to 5 p.m. (CT) Monday through Friday or online at www.lifetonesafety.com and click on the Product Safety tab for more information.